Operatives of the IGP Intelligence Response Team, IRT, has handed over three suspected Advance Fee fraudsters to the Ibadan office of the Economic and Financial Crimes Commission, EFCC for further investigation. Ebenezer Adeniyi Oluwafemi, Kolade Samuel Sogo, and Olwagbenga Majeed Ejikunke. 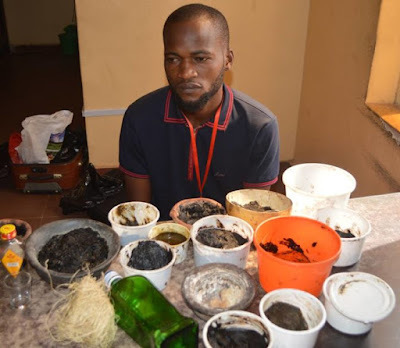 They were arrested Tuesday 4th, December, 2018 in Ilesha, Osun State following series of intelligence gathered by the operatives. Preliminary investigations further revealed that the suspects allegedly got involved in different romance scam posing as female foreigners to fleece unsuspecting victims on the social media. At the point of arrest, varied fetish materials, two laptops, and five different brands of telephones were recovered from them. Several documents containing false pretences were also recovered from the suspects. 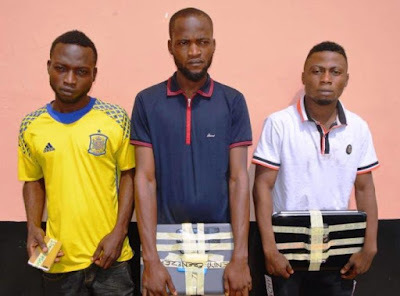 According to the Head, Ibadan Office, Abdulrasheed Bawa, the handing over of the three suspects brought the total number of Advance Fee fraudsters arrested in the Ibadan office to 40 in the last couple of weeks. “The zone is no longer a hiding place for the fraudsters”, he stated. Investigation is still ongoing and the suspects will soon be charged to court.